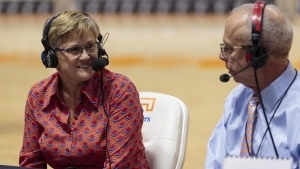 KNOXVILLE, Tenn. — Tennessee head coach Holly Warlick met with members of the media on Wednesday in advance of Thursday’s matchup between the No. 13/13 Lady Vols (12-2, 1-1 SEC) and No. 16/16 Kentucky (14-2, 1-1 SEC). Tip-off is slated for 7 p.m. ET, with SEC Network televising. UT and UK both enter the game looking to bounce back after suffering their first SEC losses on Sunday. The Lady Vols fell in a close one at home against Missouri, 66-64, while the Wildcats lost on the road at No. 7/6 Mississippi State on Sunday, 86-71. This marks the 67th meeting between these programs in a series that ranks behind only UT-Vanderbilt (80 games) and now ties with UT-Georgia (67 games) for most times played. The Lady Vols lead the series, 55-11. Tickets are priced as low as $10 are available at AllVols.com.